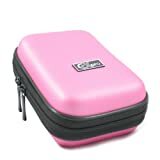 Posts related to Ex-Pro® Pink Water & Shock Proof Digital Camera Case Bag CR90512R (Cameras upto 110mm x 72mm x 40mm) - Acer, Agfa, Canon, Casio EXilim, Fuji Finepix, GE, Hitachi, Kodak Easyshare, Nikon Coolpix, Panasonic Lumix, Praktica, Polaroid, Olympus, Pentax Optio, Samsung Digimax, Sigma, Sony Cyber-shot, Traveler, Vivitar and more & More. This entry was posted in Discount Photography and tagged 110mm, 40mm, 72mm, Acer, Agfa, Camera, Cameras, Canon, Case, Casio, Coolpix, CR90512R, Cybershot, Digimax, Digital, Easyshare, Exilim, ExPro, FinePix, Fuji, HITACHI, Kodak, Lumix, More, Nikon, Olympus, Optio, Panasonic, Pentax, Pink, Polaroid, Praktica, proof, Samsung, Shock, Sigma, Sony, Traveler, upto, Vivitar, Water by Ball Photo. Bookmark the permalink.